Cozy and affordable bedroom with a private bath. One block to MAX light rail while also being within walking distance to supermarkets, bars, banks, restaurants, and even a food truck pod. 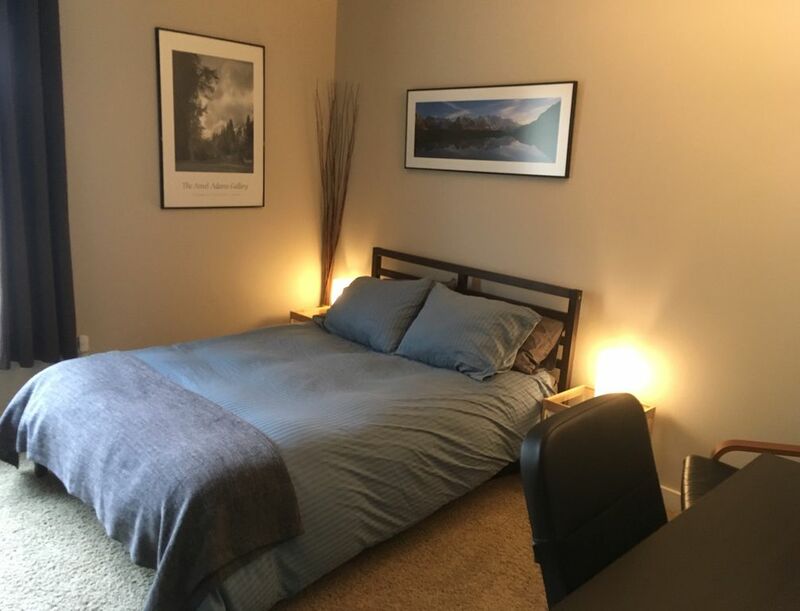 The guest room has a queen bed, desk, storage, smart TV, and walk-in closet. You also have complete access to the kitchen, living room, and balcony. The guest bedroom is on the main level, while our rooms are leave the main level for you as much as possible. Some guests we never run into. :-) Also FYI, we have a Havanese puppy, he’s always with us, is calm and quiet, and it’s a hypoallergenic breed. I love Portland but also love traveling all over the world. I'm from the Midwest originally and have lived in Portland for several years. We are either out or we hang out upstairs mostly when guests are in town. Good location, good value, nice amenities and you have the living room, kitchen and balcony to yourselves unless we're fixing breakfast or passing through. We're close to everything on the East side, less than a block to the MAX, the airport, right off I-205, and the two bus lines go down Burnside St and Belmont St to the popular Hawthorne area. Also close to banks, supermarkets, good food, shopping, and Mall 205. Full bath with shower. Towels, hairdryer and toiletries provided. I use hypoallergenic, chemical-free, fragrance free detergent. $10/basket. Machines not accessible to guests. Coffee machine with timer. Grinder and French press also available. Anything in the refrigerator door, such as margarine, salad dressings, condiments. Also, coffee, tea, sugar, cooking oils located on the lower shelf in the cabinet next to the refrigerator. Help yourself to anything you find. 32" Smart TV in the room. 55" 4K Smart TV in the Living Room. Ask for details about renting my double kayak (can also be used as a single). Cigarettes on balcony only. Ask about weed. I was very comfortable at Maya's place. The bed was comfortable. I was warm. The room is set up with everything a guest needs. The internet worked great. It was a 12 min ride to the airport, and a 15 min car ride or a 25 train ride to the Oregon convention center, where I was commuting. The price and the thoughtful care taken with the space made the distance worth it. Cozy and well appointed. Good neighborhood. Maya is an excellent host and made our time there easy and relaxed. Maya was a great hostess! Great place to stay. It is close to some restaurants, bars, and stores. Maya was really helpful, and she gave us advise of which places to visit when we were in Portland. I highly recommend to stay on her place. I was in Portland earlier this month for a video project and stayed at Maya's home. It was very comfortable. She was an excellent host. Her home is also located in a great location - near shops, restaurants, the train line, and it's not too far from the highway and PDX. Fred Meyer & WinCo supermarkets one mile North on 102nd. Lots of nearby restaurants, banks, bars within walking distance around Mall 205. All of Portland available via the Blue line MAX and buses 15 and 20 for Belmont & Burnside routes. Check trimet.org for public transit info.